AIK. KYRIAZAKOU & SIA OE. , A CONSTANTLY EXPANDING COMPANY IN THE MARINE AND INDUSTRIAL SECTORS, HAVE CREATED ITS OWN SPECIAL SECTION OF MARINE SAFETY BELTS MANUFACTURING FOR LIFEBOATS AND CRAFTS, TECHNICAL SUPPORT SAFETY AND VARIOUS OTHER APPLICATIONS. ALL THE METALLIC PARTS OF OUR BELTS ARE STAINLESS STEEL ( 316 ), THE WEBBING STRAP ( 5 CM ) AND THREADS ARE OF POLYESTER/ NYLON IN ORDER TO WITHSTAND THE DIFFICULT CONDITIONS AT SEA. OUR MARINE SAFETY BELTS ARE PRODUCED BY OUR EXPERIENCED STAFF FOLLOWING THE HIGH INTERNATIONAL STANDARDS NECESSARY IN ORDER TO ENSURE GOOD PERFORMANCE AND ENDURANCE. 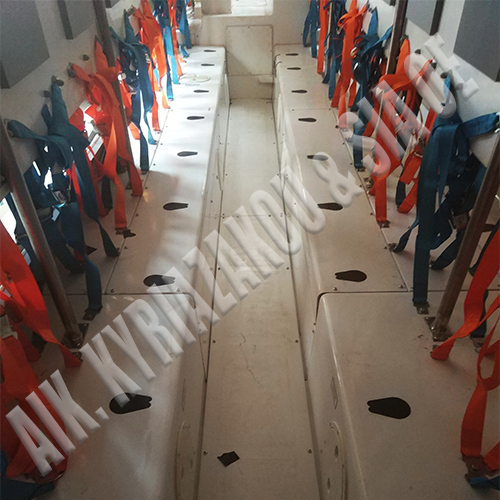 WE CAN PRODUCE ANY POSSIBLE DESIGN OF SAFETY BELT APART FROM THE USUAL 2-3-4 POINTS ON DEMAND AND ACCORDING TO CUSTOMER’S DESIGN OR SAMPLE. WE’D BE HAPPY TO SERVICE IN THIS FIELD BY OFFERING A HIGH QUALITY PRODUCT IN WHOLE SALE PRICES, REMAINING FOCUSED TO OUR TARGET THAT IS NO OTHER THAN THE FULL SATISFACTION OF OUR CUSTOMERS.